"Erik (Eirik) the Red’s Saga" was composed before 1265 in northwestern Iceland. In spite of the name, it deals primarily with Thorfinn Karlsefni and his wife Gudrid, also known from the "Saga of the Greenlanders". It occurs in two written versions. One is Skálholt Book possibly because it was written by a cleric at the Skálholt monastery in southwestern Iceland. The other is Hauk’s Book, penned around the years 1306 to 1308 by the prominent Icelander Hauk Erlendsson who lived from 1265 to 1334. Hauk [the name means ‘hawk’] was a Law Speaker and served as a delegate at the Norwegian court. Hauk was a direct descendant of Thorfinn Karlsefni and Gudrid via their son Snorri. They were in fact his great-great-great-great-great-great-great-grandparents. A Swedish scholar, Sven B. F. Jansson, has made a word-for-word comparison of the two versions of "Erik the Red’s Saga". 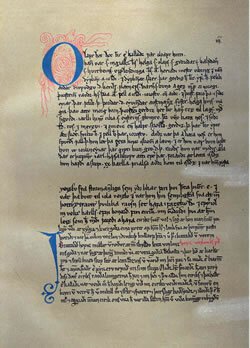 His conclusion is that Hauk had edited a manuscript more or less identical to the Skálholt Book. Hauk made notes in the margin and clarified and added to some passages, and he is more specific. For example, where Skalholt Book says ‘birds,’ Hauk’s Book says ‘eider.’ Possibly Hauk was drawing on information preserved within his own family. "Erik the Red’s Saga" tells of the same events as "The Saga of the Greenlanders" but with a twist. Here the expeditions of Leif, Thorvald, Karlsefni and Freydis have been combined into one single expedition led by Thorfinn Karlsefni and Gudrid, where Thorvald and Freydis figure as partners. The size of this expedition is the same as all of those of the "Saga of the Greenlanders" combined. Leif’s role has been reduced to that of accidental discoverer, being blown off course en route from Norway to Greenland. Only Thorsten’s expedition is given equal treatment. Again we are told that it never reached its goal but was storm-driven all summer before returning to Greenland without ever having seen Vinland. Instead of the one base establishment, Leifsbúðir, there are two. The main base where everyone spent the winter is Straumfjord, Fjord of Currents. Straumfjord is in northern Vinland. There is also a more southerly base, Hóp, Tidal Lagoon. It is here they harvested grapes and cut lumber. However, here they also came into contact with large groups of native people. After fights ensued, Karlsefni and his group returned to Straumfjord. In other aspects the events are much the same as those of the "Saga of the Greenlanders". There are explorations in different directions. One group went north but was storm-driven eastwards all the way to Ireland where everyone was enslaved. Exploring in a northerly direction, another group encountered five native people sleeping on the shore, whom they killed. Here Thorvald died from an arrow presumably shot by a native person, although the saga calls him a ‘uniped, or ‘one-footer.’ The survivors returned to Straumfjord for the winter and set sail for Greenland the next spring. They had spent three years in Vinland and Snorri had been born to Karlsefni and Gudrid already the first year.